There are a few quality indoor and open-air art markets in New Orleans, so you have choices all year round in addition to all the great galleries in the French Quarter, Warehouse District, and on Magazine Street Uptown. Prices range from a few bucks to four digits, and the options are plentiful, from the souvenir trinkets to unique local art. Whatever you’re on the hunt for, you can find piece of art with your name on it at these New Orleans art markets. This sprawling open-air mall was founded in 1791, which makes it the oldest continually operating public market in the country. You can spend hours strolling through this five-block market reminiscent of traditional European markets, from the daily flea market at the end of Esplanade Avenue, through the farmers market stalls, and all the way through to Cafe du Monde on Decatur Street. Vendors offer their creations in all price ranges. Depending on the time of year you visit the French Market, you might walk into a festival taking place, and there’s a good chance you’ll be hearing live music on any given day. Located on a busy block of Decatur Street not far from the French Market in the French Quarter, SecondLine Arts & Antiques gets a lot of foot traffic in its expansive indoor and outdoor spaces. The inside is crammed with both the funky, junkyard-type salvaged pieces of ironwork, signs and windows, and the more serious antiques. Right outside, the daily outdoors art and flea market is filled with furniture and tons of local art, all priced to move quickly. You can also rent a bike, book a tour, or get a snowball there. The Arts Market New Orleans is the Arts Council’s free, open-air, family-friendly monthly marketplace that features between 80 and 130 artists, both local and from all over the Gulf Coast. You’ll find affordable paintings, photography, ceramics, and glasswork, plus everything from jewelry to soap. Food vendors and live music are also featured. Hours: Monday – Saturday 10:30 a.m. – 6 p.m.; Sunday noon – 5 p.m. Located on Magazine Street between 7th and 8th streets, this permanent indoor market features more than 100 shops under one roof. There you’ll find locally made art, clothing, crafts, home decor, and jewelry you can take home. The eclectic inventory is mostly handmade, and maintains the green theme by featuring recycled and repurposed items. 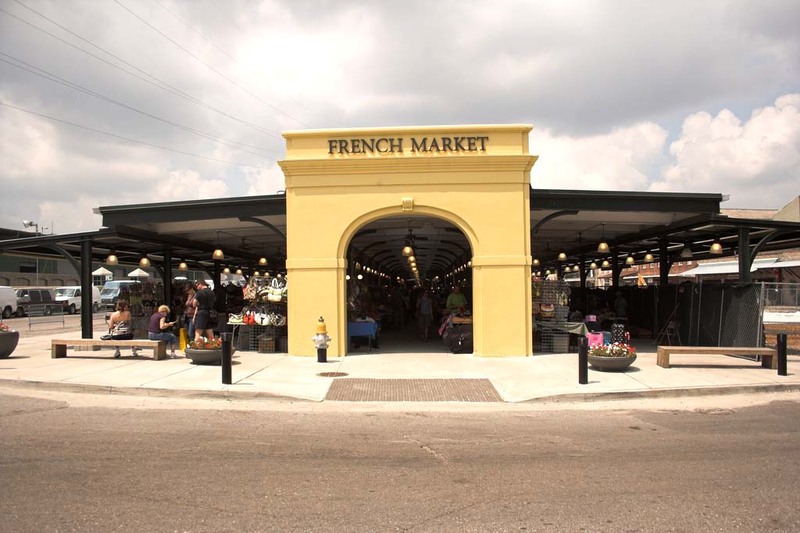 Freret Market was born in 2007 as part of the revitalization effort of the commercial corridor of Freret Street, and has been impressively successful since. This open-air market combines the elements of art, food and flea markets, and features about 90 vendors offering everything from crepes to dog adoptions. The market also features special events, local restaurant and catering business pop-ups and food carts, and live music. Freret Street also kicks it up with an annual festival on the first Saturday of April, with about 200 vendors participating, many of whom are the market regulars. Named after its street name location, the O.C.H. Art Market is both an indoor/outdoor free, family-friendly market hosted by an art center located in a historic building in the revitalized section of the Oretha Castle Haley Boulevard. The market offers local arts and craft, live music, and food pop-ups that focus on healthy choices. Hours: 5:30 a.m. – 11 p.m. Although this one is technically not a market under any organization’s umbrella, the art lined along the fence and on the sidewalks of Jackson Square and the Pontalba buildings flanking it often rivals what you might find in a gallery on Julia Street. The loose, self-regulated colony of artists that, weather permitting, displays their original artwork day in and day out, is as essential to the scene as the historic buildings themselves. All vendors have a permit from the city, and quite a few of them were selling in Jackson Square for decades. You’ll find them all year round, but more artists come out on weekends, in the evenings, and during big events like Mardi Gras.